Most ‘Southerners’ don’t stay in Muskoka for the winter, leaving all those great winter activities for the locals. Doesn’t have to be so. When the temperature drops, the snow falls and the winter clothes come from storage, people tend to hunker down indoors and pine for spring. In Muskoka, in central Ontario, pining means flying past a tree at top speed on cross country skis, snowshoes, speed skates—even dogsled. In Muskoka, winter is another season to sweat! In 2012, National Geographic Traveler magazine picked Muskoka as a Top 10 place to visit in the world. The year before, it made their Top 10 summer trip list. Two hours north of Toronto, the district has a population of about 60,000 people. In summer, when “Southerners” come up to take residence in their cottages, the population more than doubles and stays there until September. To truly experience Muskoka, however, you must leave the cottage and head outdoors. Check it out: Winter can be as lively as any other season. Ice climbing can be a fantastic—and safe–way to climb frozen waterfalls and rappel down rocky cliffs on the gorgeous Canadian Shield. A few companies offer ice climbing trips complete with training, equipment and secret routes—still undiscovered by the masses. Outdoor climbing involves the use of crampons, ice tools and specialized boots. For indoor climbing, Muskoka heads to the only public indoor climbing wall in the area–the Bracebridge Sportsplex. The landscaped wall is 32 feet high, with five routes and two auto belay devices, giving you the thrill of climbing when the hill is too far. Fitness classes are available on the wall and include women’s climbing, youth development, meditation and yoga on the wall, as well as a blend class featuring interval training and Zumba Fitness. This is the best way to see Muskoka while your legs get stronger and your endurance improves. There is a range of routes available. Do you have young children? Some locations offer winterized chariot rentals with adult ski rentals! You can find ski chalets hidden in the woods and secret ice skating rinks hollowed out of meadows. The trail centre in Bracebridge also offers groomed trails, with cross-country skiing and snowshoe-specific routes, complete with dog areas. Local businesses rent out all the equipment you need. Are you a biathlete? You can find safe areas to practice your marksmanship. Muskoka is also is home to wide open spaces, perfect for kite skiing. Walkers who want to spend some indoors can visit the Huntsville Summit Centre or the Bracebridge Sportsplex for their indoor walking clubs that also include poles to borrow and basic instruction. Every township has an indoor ski rink, with many more carved out of Crown land, front yards, back yards and parking lots. The best skate experience has to be the 5km speed skating route laid out at Arrowhead Provincial Park. The lights hanging softly in the trees with snow falling is as close to Narnia as to be believed! Bring back that childhood feeling of hurtling down icy hills holding on for dear life to a piece of rubber–and you’ve got tubing! Children as young as two are able to enjoy a variety of hills ranging from small bumps to what I felt was K2. Try tubing at Arrowhead Provincial Park or the Big Tube Park in Huntsville, located right downtown. What is running but two feet working their way towards a destination? Winter running is a beautiful experience if you have layered clothing and proper footwear. Be sure to wear shoes with additional traction, layer properly and hydrate regularly. Wearing mittens over your gloves will keep your fingers from freezing. Running in January improves my running time in the following seasons and is a true validator that you made an effort to be active! Local pet businesses offer specialized boots for your furry partner to avoid pad damage on their paws. For the outdoor lover, the ace in the hole is Algonquin Provincial Park. 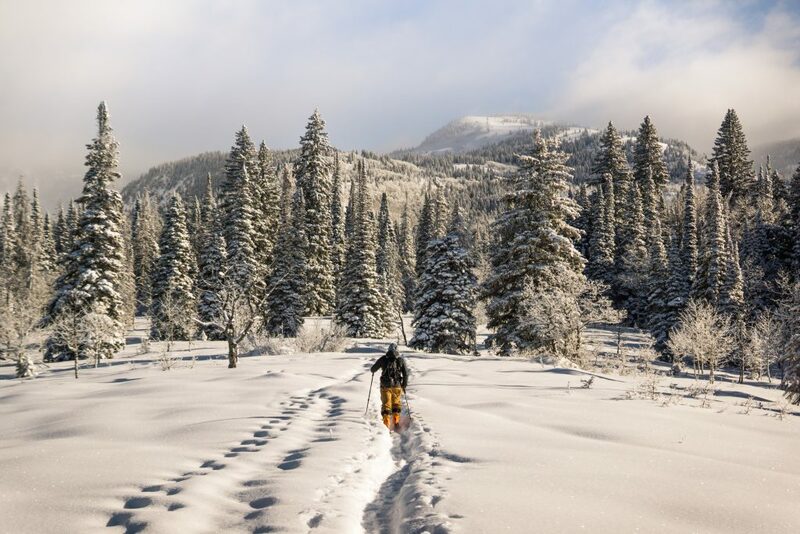 Take the time to enjoy all this park has to offer in the winter months: Dogsledding, yurt camping, snowmobiling, skiing, backpacking, art adventures and the opportunity to see moose, deer and winter birds. They’ve got over 653,000 hectares to explore. Lots of snow means somewhere there’s going to be a hill. Muskoka is no exception. Hidden Valley in Huntsville offers day and night skiing, snowboarding, family programs and beautiful accommodations. The ability to work on that slice can only be done at Muskoka Highlands Golf Course. In winter, Muskoka’s largest training facility also has a popular golf simulator. This facility is family friendly and located close to downtown. After all those winter sports, indoor golf can be a good way to warm up—and chill out. Fyonna Vanderwerf and her family of boys have been Muskoka residents for years. Their favourite winter activity is to ski out their backdoor to trails behind their home, then return for hot chocolate, giant marshmallows and a crackling fire. This winter, the whole family is tackling ice climbing.